After a disappointing defeat at her final middle school competition, Kumiko loses her passion for wind ensemble as she enters her first year of high school. 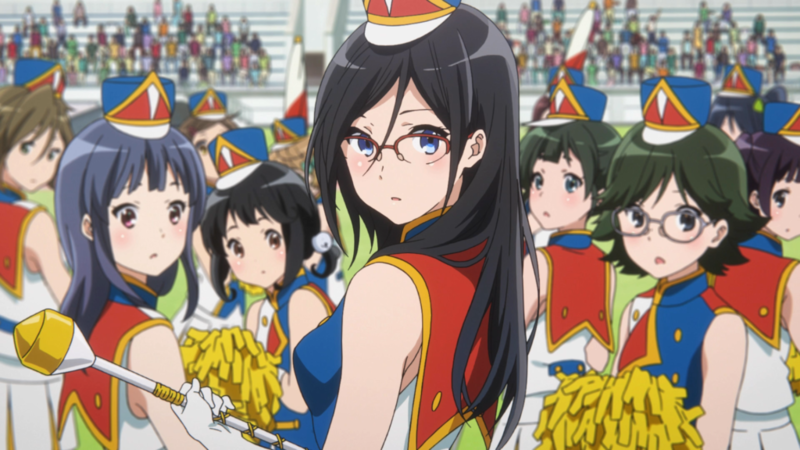 Despite intending to leave music behind her, she finds herself peer-pressured into joining Kitauji High’s band club, once again playing the euphonium. 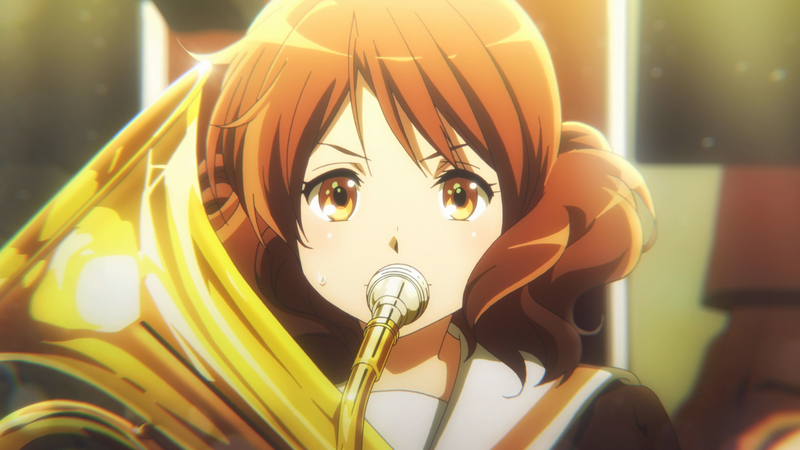 With a famed and ambitious young advisor, Noboru Taki, at the helm, the pressure is on for the lacklustre club to shape up and finally make it to the national tournament, but this goal only serves to expose the fragmented and rocky relationships between members both past and present, including Kumiko’s ex-classmate, the enigmatic yet extremely talented trumpet player, Reina Kousaka. Whilst it may be hard to believe, given the current state of the anime scene, there was once a time where being a slice-of-life show didn’t automatically mean it was a comedy too. Nowadays, the two genres are practically stapled together, with slice-of-life almost expected to be comedic in nature, mostly due to the popularity and quality that this combo delivers. Kyoto Animation were amongst the pioneers of the slice-of-life comedy anime in the early 2000s, with the one-two punch of Lucky Star and K-On, which rank amongst the genre’s best and are highly regarded by the community at large. So, it was perhaps quite the surprise that KyoAni gave us Sound! 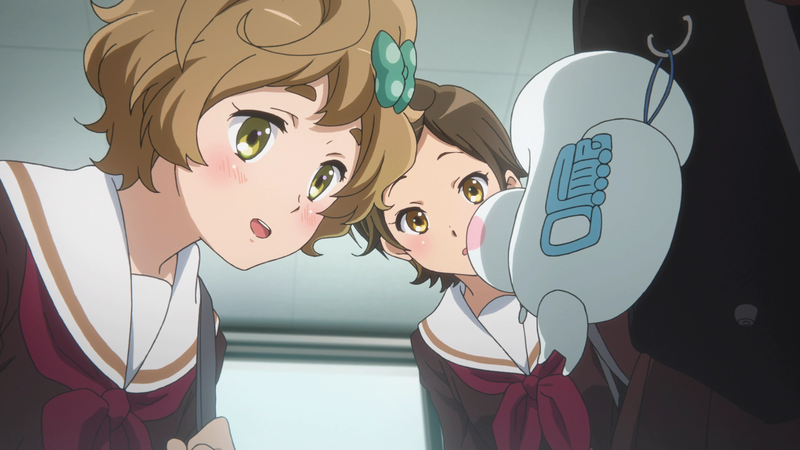 Euphonium back in 2015, which leans far more into drama than comedy, and results in one of the finest works this medium has to offer, regardless of genre. The first element of note, and the most instantly noticeable as soon as you start watching, is just how jaw-droppingly gorgeous this show is from an animation standpoint. Kyoto Animation have built up quite the reputation over the last decade due to the quality of their output, and this is definitely one of their best to date. The amount of detail packed into every frame cannot be overstated, and it looks downright beautiful as a result, especially the scenery and backgrounds. Sound! also sees a masterful use of post-processing effects too, employed in order to complement and enhance certain scenes or sequences, without over-egging the pudding and becoming a distraction. Some may not like this approach, but I think it is executed flawlessly, and it’s hard to argue against when the final product looks this gorgeous. I’d also be remiss if I didn’t mention the facial expressions too, which manage to be emotive yet incredibly subtle, with feelings even being conveyed purely through close-ups of characters’ eyes. This sets a new bar for others to beat, and so far, it’s only been KyoAni’s later works such as A Silent Voice that have managed to match it. Putting aside the animation, the majority of people’s reaction to Sound! on initial viewing, if they’re going in blind, would be total shock. 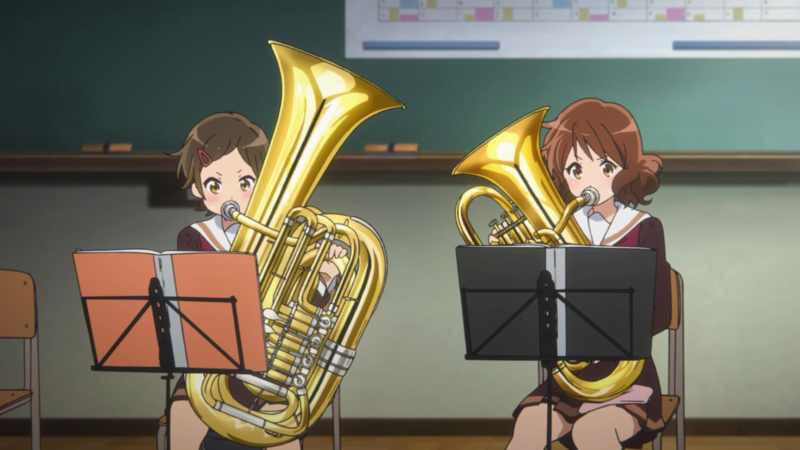 You see the key visuals of cute girls and their brass band instruments from the studio that brought you K-On! and of course you’d likely assume you’re in for something in the same vein, with the music being relegated to the background whilst a bunch of moe school girls mess around, and maybe occasionally play a song, and you would not be further from the truth. Sound! is not without moments of levity, but mostly relies on drama as the main conceit of its narrative. I read a lot of comparisons to the 2014 film Whiplash, which starred J.K. Simmons as a talented but abusive jazz band instructor, and although they were mostly tongue-in-cheek, you can certainly see some similarities there. Sound!’s story, more than anything, is about taking a middling band and pushing them to the brink, sacrificing compassion for brilliance, and whilst you won’t see Taki try and bounce cymbals off of his student’s heads or make them play until their fingers bleed like in Whiplash, his brand of unflinching and brutal honesty does push the characters to their emotional limits, and it is this that yields fantastic drama. Most of the tension comes from the conflict of talent over seniority, with parts distributed by skill rather than age, and what makes this effective is that you could justify both sides of the argument. A microcosm of this can be found in the latter half of the series, with a first year getting picked to perform a solo over someone in their third and final year of school. The third year thus loses their last chance to perform, which results in an emotionally devastating episode that genuinely had me in tears. The emotional impact of this scene, and a handful of others like it sprinkled throughout, are really a testament to how well written not only the story is, but the characters too, with an emotional connection being established with the audience in such a short amount of time, helped in no small part due to the animation too. Whilst intense band drama is Sound!’s bread and butter, there are episodes that dial it back a bit, and push towards the more slice-of-life side of things, most notably early on in the first half; however, it is the eighth episode that stands out as potentially the best of the bunch. Festival episodes are an anime staple, but none have been quite as effective as this one in my eyes, featuring a fairly realistic, and to many, relatable, take on high school romance. The ending, which features Kumiko and Reina performing on a mountain top, is simply breathtaking, highlighting the top-tier animation and giving the episode closure without so much as a line of dialogue, simply letting the melancholy music and superb visuals tell the story. Now, nothing that I’ve praised so far about the story would work at all on an emotional level if not for a quality level of character writing, and this is yet another facet of Sound! that does not disappoint. 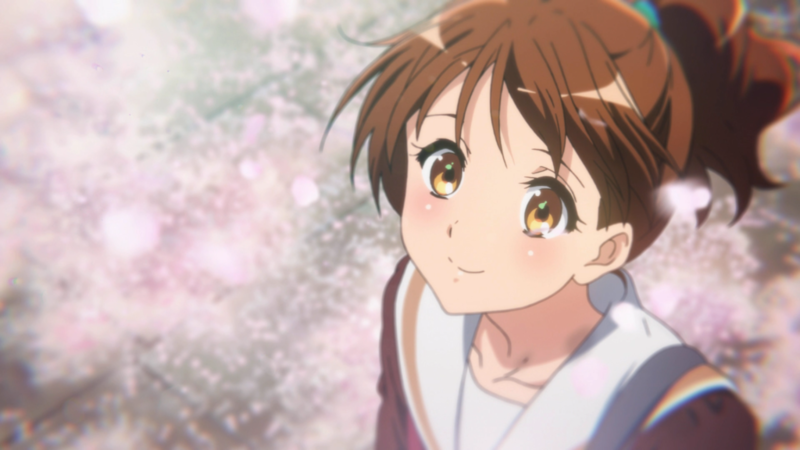 Although KyoAni shows of the past have been largely ensemble-based affairs, this takes a different approach, laser-focusing on a single character instead: the lead, Kumiko. She is an excellent character, but not exactly one I took to right away on my initial viewing, writing her off as rather dull, but on further re-watches and perhaps also down to my own maturation over time, I’ve come to really appreciate her. A lot of anime focuses on over-the-top caricatures of real people, playing up the various stock personality types to the nth degree, making for memorable characters, but not exactly realistic ones, often making them hard to connect with on a personal level, a trap that Sound! happily avoids. Kumiko is one of the most human characters I’ve come across in the medium. Her social awkwardness and general apathy at the start of the show is painfully relatable, yet still somewhat charming, and it makes the audience all the more invested in her journey of self-discovery as her passion for music is reignited. One of the main motivators for Kumiko throughout the series is her relationship with her ex-classmate Reina, who I can imagine will be quite polarising. She is arrogant, abrasive and on occasion callous, but strives for true greatness, to become someone special and stand out from the crowd by any means necessary. She is truly fascinating and unique, and her complicated relationship with Kumiko and how it evolves is certainly interesting to say the least. 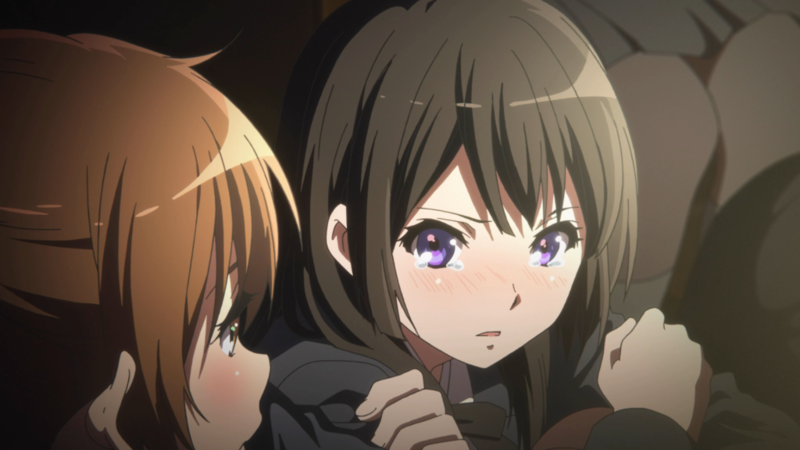 The dedication to Kumiko’s perspective doesn’t mean the supporting cast are totally left in the dust, despite her getting easily the most growth, with characters such as her fellow first year Hazuki and disenfranchised fellow euphonium player Natsuki developing in some respect over the course of the series. There are certainly characters I’d like to have seen get more screen time, such as the quirky but seemingly disingenuous upperclassman Asuka, but saving character development for a sequel isn’t exactly a bad thing, and having seen the second season already, I can say with certainty this was the correct choice to make. Whilst Sound! 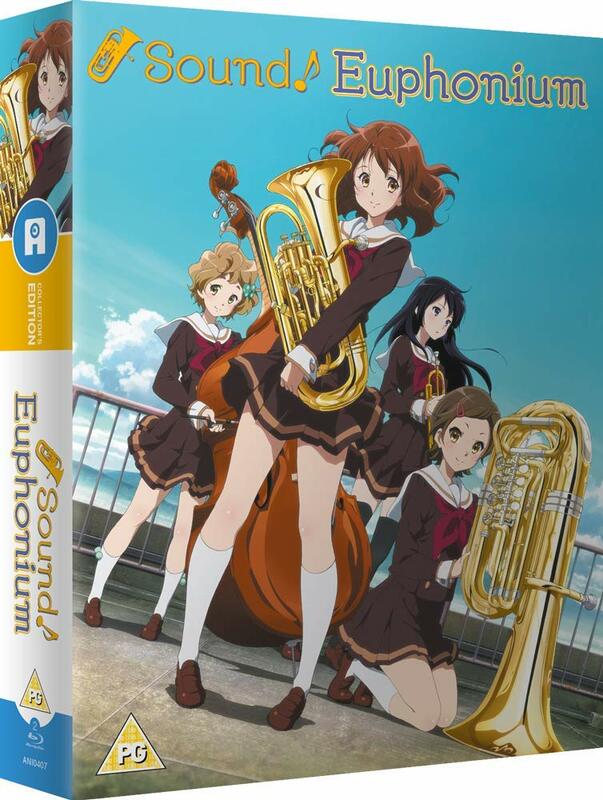 Euphonium’s release may lack any sort of English dub, this is easily made up for by the sheer quality of the seiyuu on the Japanese track, with everyone giving an absolutely stellar performance without exception, with the cast including Tomoyo Kurosawa (Land of the Lustrous), Moe Toyota (Beyond the Boundary), Chika Anzai (Chaika The Coffin Princess), Ayaka Asai (Testament of Sister New Devil) and Takahiro Sakurai (Berserk (2016)). Just as important as any voice actor in this series is the music, and Akito Matsuda (Non Non Biyori, No-Rin) did an incredibly impressive job. Not only did he create sublime background music, he also composed a full wind ensemble piece entitled Crescent Moon Dance, just for use within the show, credited to a fictional composer. I am just floored by how good this composition is, and was blown away to find it was created by Matsuda, and not a well-known classical composer. In fact, since the release of Sound!, sheet music for Crescent Moon Dance has been published, and the piece is gaining traction as a legitimate composition to be played by ensemble bands in Japan, which is simply amazing to hear. On top of the thirteen episodes and OVA contained within Anime Limited’s limited edition release of Sound! 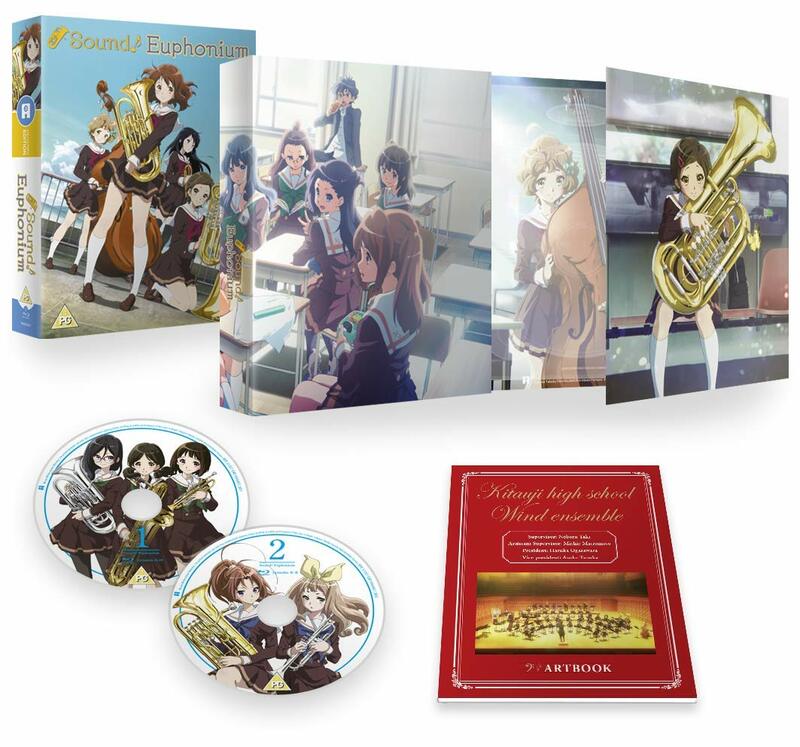 Euphonium, you also get a lovely artbox and booklet showcasing the character designs and backgrounds, which is certainly appreciated on a show with animation as lovely as this one. On top of all that, you can also find seven bonus OVAs, each two minutes in length, which serve as a nice supplement to the main series, and are a good bit of fun, especially the one explaining Midori’s rather amusing obsession with Tuba-kun. My sole complaint with this release would be the subtitles. This isn’t an issue with the translation, but rather the subtitles themselves, being rather small with only a thin black outline that makes them hard to read, especially at distance. For an anime that contains large amounts of white in the form of uniforms and sheet music, having a thin outline can sometimes make reading a difficult task, although it is far from a deal breaker as far as I’m concerned. Even amongst Kyoto Animation’s prestigious back catalogue, Sound! Euphonium carves out a place amongst the very best, with a subtle blend of slice-of-life and drama, and understated yet well developed characters, topped off with truly breathtaking animation and music. 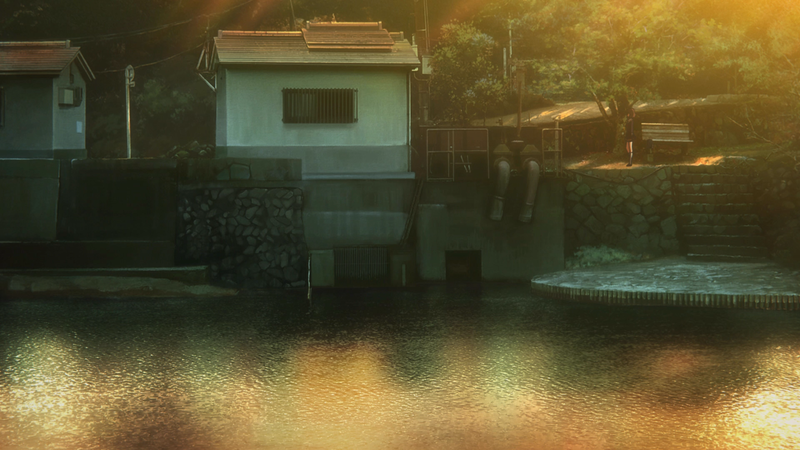 With a lovable cast of characters, superb animation, and a real attention to detail, Hyouka comes highly recommended by me. It might sound boring on the surface but give it a try and you’ll find something truly fascinating.